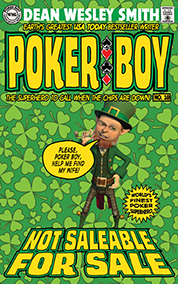 Lenny the Leprechaun’s wife went missing and now he wants Poker Boy to find her. Not known for finding people, Poker Boy only rescues people and dogs and the world in the process. Mrs. Lenny’s vanishing act seems to have no connection to Poker Boy. Until Poker Boy looks deeper. Then Poker Boy knows he might be able to save her, if she still lives. Which he doubts.